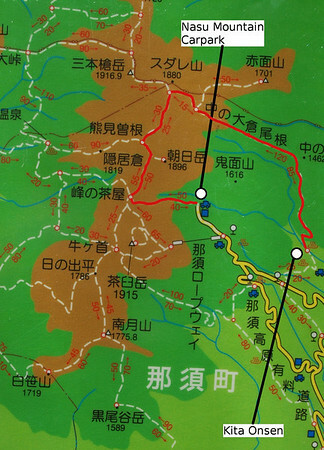 Kita Onsen - map location must be one of the great hot springs in the Nasushiobara area. It has a beautiful location, good water, lots of history and style. You can stay at Kita onsen overnight or you can drop in for a day onsen. Its also one of the entry points to Nasu park. 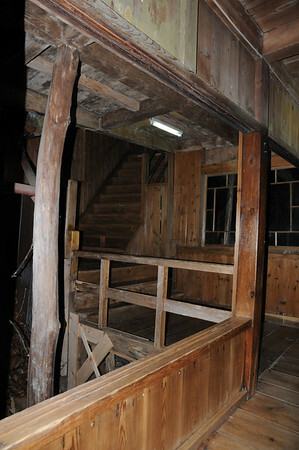 I don't know the history of the Kita onsen building. But I know Kita onsen opened in 1696! The building is really old. Sometimes I think Japan defines rustic, dilapidated and the boundary between differently. But Kita isn't about faded carped and rusty metal, its definitely rustic and has heaps of style. If you go there for a day onsen the entrance area will be full of friendly walkers flopped around the firepit. Its a great place. 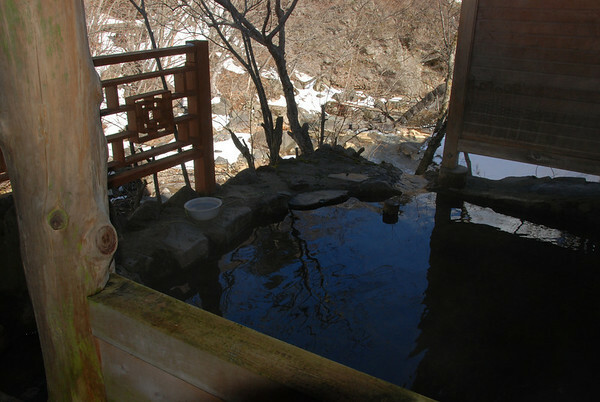 There are a number of pools in Kita onsen. First up there is a giant one out the front. Its not my favorite one due to the fact the arrival path goes right by it and a number of rather crappy additions (like the metal slide). Never the less I've sat there looking up at the mountains under moonlight with a group of friends and can say its very nice. The best pool is the roten up the back. Good views of the river and the strange concrete structures it flows over. The water here is good, flow is great. You can stay at Kita overnight. I recommend it. The great old building made of heavy timber has a great atmosphere. The staff are very nice. 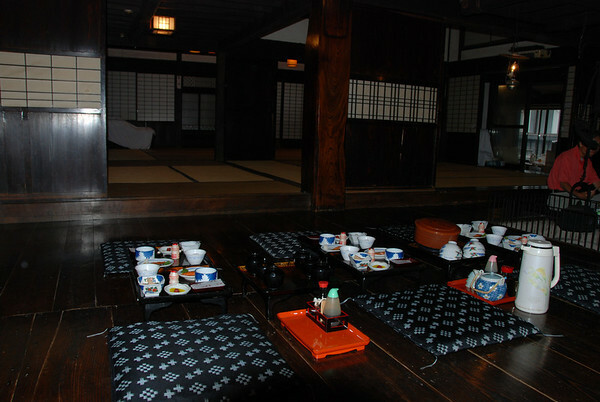 Its the the lower cost, simpler end of the ryokan experience though. Dinner is simple and eaten in your room. Its good. Breakfast also simple and eaten in a dining hall. When we went we had it all to ourselves pretty much. Its some time since I went, but it cost 6 or 7,000 a head for 4 to a room for our party. If you're looking for shiny, elegant and expensive then Kita is probably not for you. Its a fairly short walk (5 or 10 minutes) from the carpark to the onsen. It can be a bit treacherous in winter. The location is fantastic at the bottom of the mountains, next to the river. If you are on foot, and you walk up the carpark and then keep walking up to the main road, across the road there is a track that will take you all the way up to Omaru. There is lots of good walking to be done in the Nasu Mountain area. The walk from Nasu Mountain to Kita Onsen is a half day walk that takes you through some nice mountains and alpine vegetation. If you do it in Spring then there are some Azalias (Tsutsuji) near Kita Onsen. On the down side its much easier to do this walk if you have two cars because the start and finish point are not so close together. This is an intermediate walk. If you don't walk regularly, you might want to do a few easier walks to build up to it. Its also a bit exposed and the weather is unpredicatable so I'd take a waterproof and something warm. Start out at the Nasu Mountain carpark (map location). We had two cars and dropped one of them at the Kita Onsen carpark (map location) first. 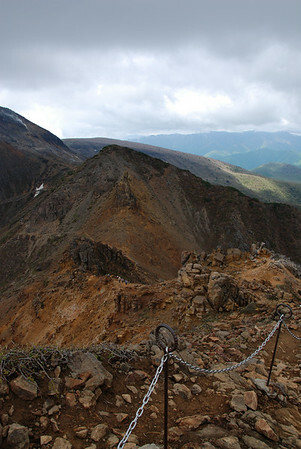 Climb to the mountain hut and then turn right to traverse along the mountain range. (you can also climb Mt. Nasu or walk to Sandogoya or Numappara from here too). 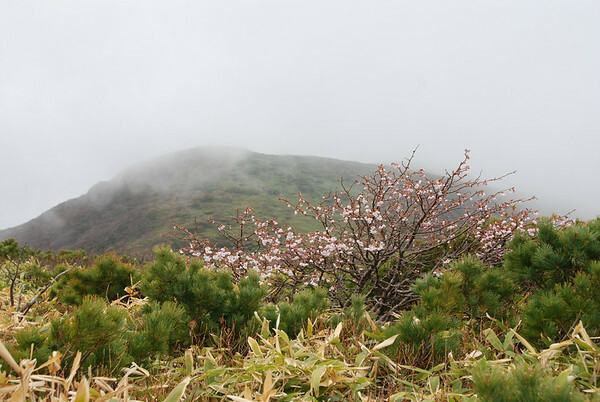 Once past the mountains there is some nice alpine scrub with Mountain Sakura. Then its a longish downhill walk to Kita Onsen. The path does split for a while and we'd suggest taking the right hand split because our the Azalias that are out in Spring. From there is a short walk up to the carpark. Its probably possible to walk back to the starting carpark, but it would be a hard days walk. On February 5th Sumo's Grand Champion Asashoryu resigned following a long line of sumo code transgressions culminating in a drunken assault outside a nightclub. 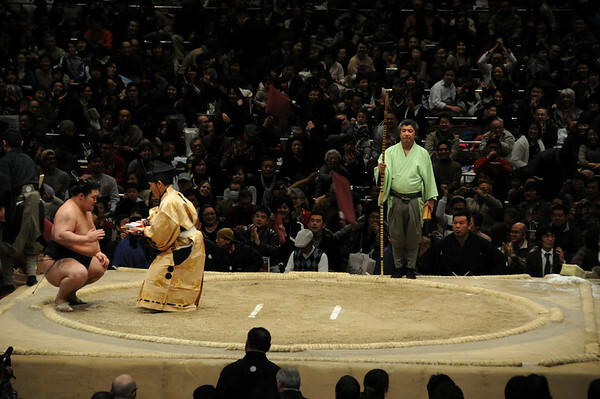 (please stop for a minute and imagine defending yourself against a drunk sumo). 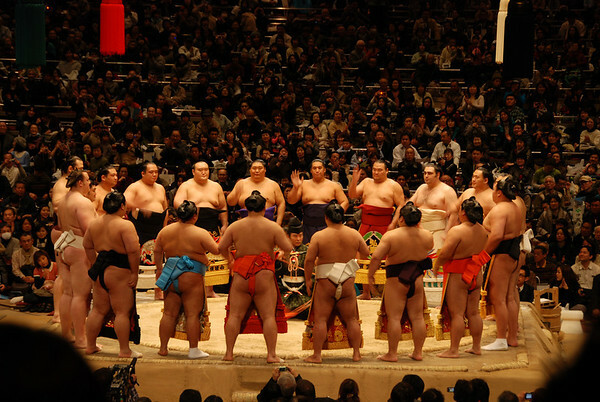 On Feb 7, 2010 there was a one day knock out sumo tournament held in Tokyo. After years of failing to make it to Sumo (including one set of unused tickets) we finally made arrangements to go. It was a fantastic event. We had high hopes and it was even better than expected. We arrived at about 1:30 not long before the main event was to start. There were some lesser bouts and demonstrations before that. 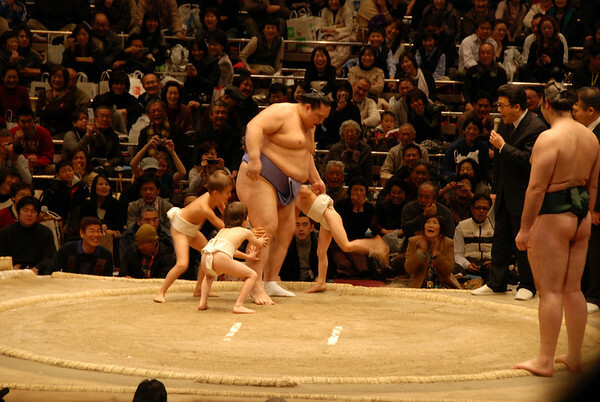 We saw some tiny kids from Tokyo International School fighting with sumos. Then there was a parade of the competitors. Then the knockout event started. There were lots of great bouts. The we've always rather liked the Bulgarian sumo Kotooshu (yes, there are lots of foreign sumos). He made it to the final round. But our new favourite is Takamisakari from Aomori. He really wound the crowd up with lots of aggressive posturing before each fight. When he lost there were cushions thrown all over the place. The final winner was Goeido who knocked out the Mongolian favourite in the semifinal. We were seated in the outer ring in the downstairs section. Great seats I think. We paid about 6000 yen each in blocks of 4. They were more like 10,000 yen each, but we got a discount through our company. Imagine the size of cushions in a Japanese restaurant and then image a small section with 4 of those together for 4 people. It was a tight fit. Go with people you don't mind being jammed together with and/or get more than 1 seat each. On the other hand we weren't uncomfortable with 4 in our box. 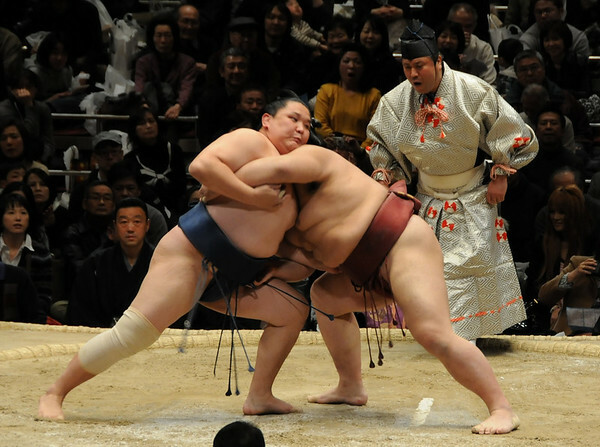 Since it was our first time at sumo so I can't say how it compared with other sumo tournaments. My impression was that since this was not part of the regular tournament schedule the competitors were more relaxed and we saw some horsing around by the sumos that I don't normally see on TV. There was one foreign guy with his girlfriend (Japanese, I guess) who were dressed in yokata. They looked really cool. That might be fun for next time. St. Michael's Church - Nasu, Tochigi. Class Act or Kitch Wonderland? 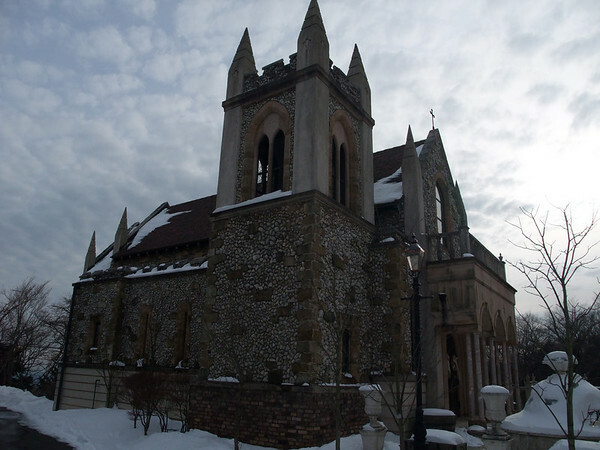 We've driven past St. Michael's many times. Its a rather kitch looking castle that fits into its Nasu Tokyo visitors paradise environment. We've never been tempted to go in. After 2 very positive visits it seems we have to admit we were mistaken. We stopped in hoping to have our lunch there. We know their sister restaurant in Nasu Garden Outlet to have rather good Italian food. 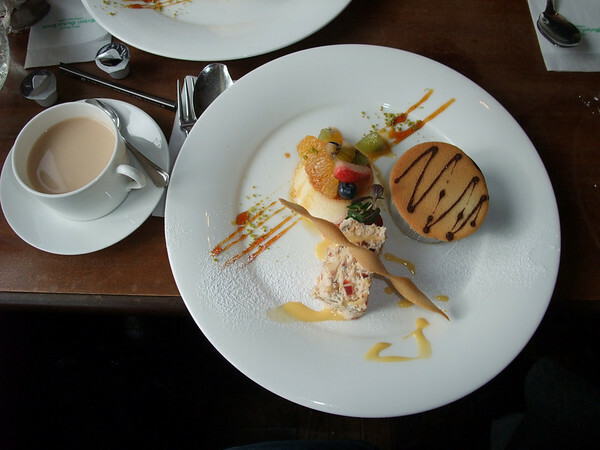 We were too late for lunch but had very good desserts and ok coffee there for not much more than 1000 yen a head. The service was great. So we decided to have a meal there. Warning: Its not as cheap as the places we normally write about. When we went they had set menus for 6000 and 9000 a head and an a la carte menu. 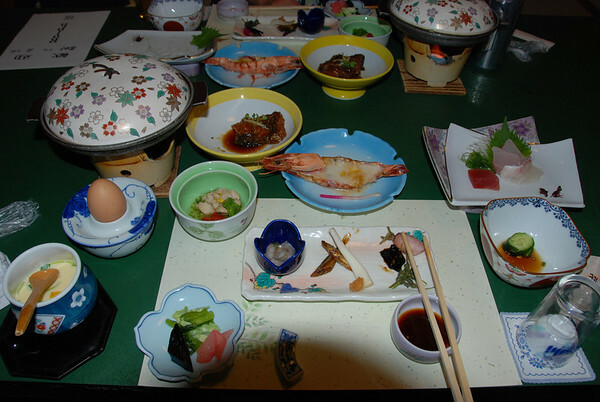 We all ordered the 6000 yen set menu. It was excellent quality with interesting dishes and diverse tastes, well worth the money. The restaurant was beautiful and the service very attentive. We felt very out of place in our Nasu hiking gear. We're going to need to go back for good photos. 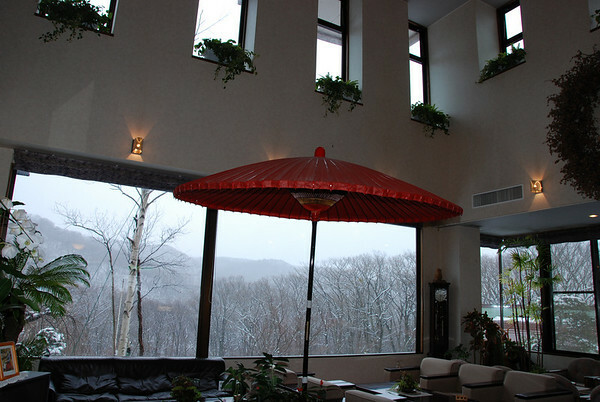 Next time we have a plan to stay up in Nasu and go there. The food would definitely pair well with a good wine. I still think the chapel is a bit kitch. The main building is pretty nice and the dinning hall is great! We are very excited about this ryokan. We just popped in for a day onsen. We'll be back to stay the night some time pretty soon. This is a beautiful area in winter. They have some little private onsen rooms. We booked one for 2500 yen for 40 minutes. We already knew the water was very good in this area (some of the best in Nasushiobara area). They have 3 private rooms that all look to be different in style. There are also larger baths that we did not visit for (I think) 800 yen a visit (separate men's and women's). The guy at the front desk spoke pretty good English. 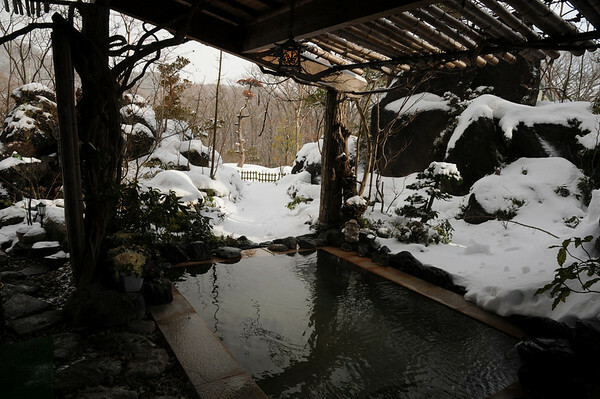 The winter rate for a ryokan stay is a bit over 10,000 yen per person for 2. It includes a Hunter Mountain ski pass. 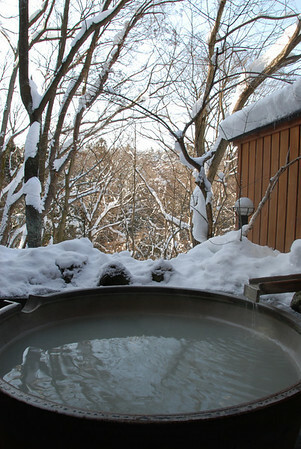 We went to Cassi onsen in the middle of winter. It was a nice winter retreat. 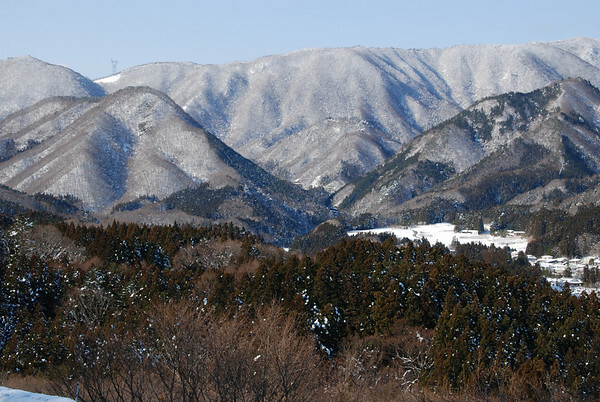 We came from Nasu along route 290 and were very, very glad of 4 wheel drive and snow tires. I think overall its much smarter to drive in via route 289 in winter. We stayed at Gohoushou. 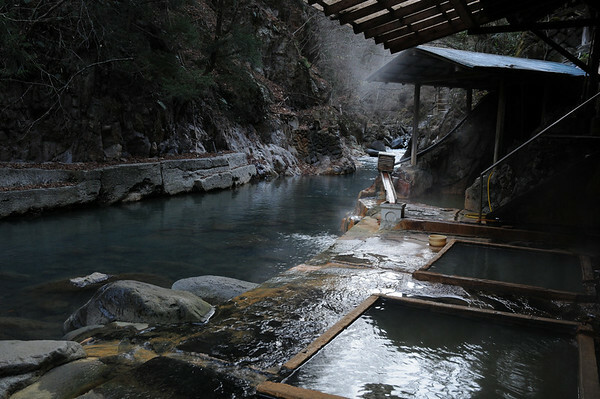 Its a good, though not remarkable onsen. 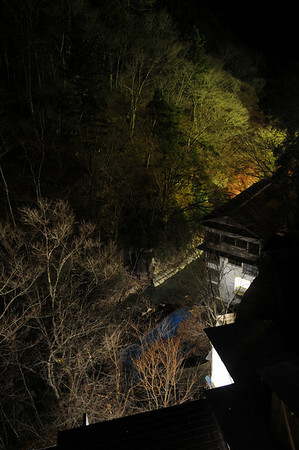 Onsen was better than good and beautifully lit at night. We drove through here ages back while exploring. Onsen areas often look a bit run down, but this place really has a gone bust look to it. 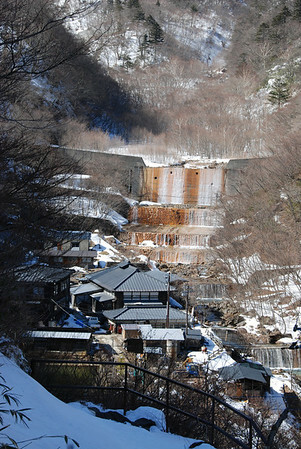 There are a few broken down onsens there slowly going to seed. We never thought to go there. Anyway, by chance we ended up spending a midweek night at Myougaya Honkan (the remaining ryokan). Wow! What a great place. I don't think we really got the photos to do it justice. There are two distinct parts to Myougaya Honkan. 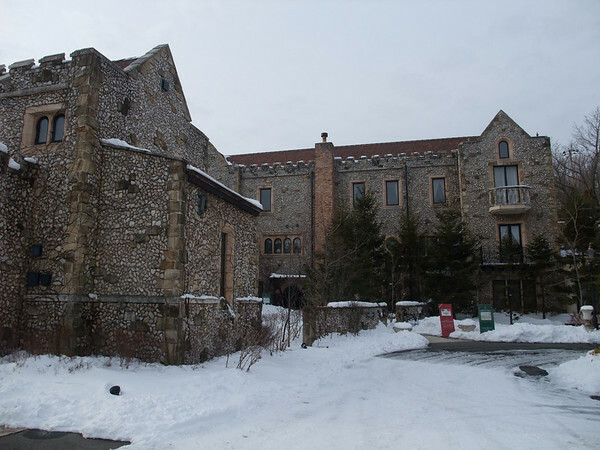 The main building is a modern building and unremarkable. Our rooms were here and they were also pretty standard ryokan/hotel rooms. Normal tatami rooms with futon beds. The view from the rooms down onto the river was very good though. The rest of the complex is old wooden buildings. The dining area is here. 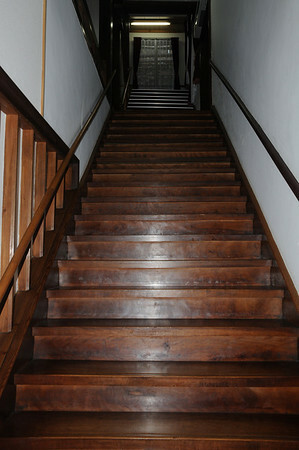 Also there is a covered stairway down to the onsen area. The food was first rate. 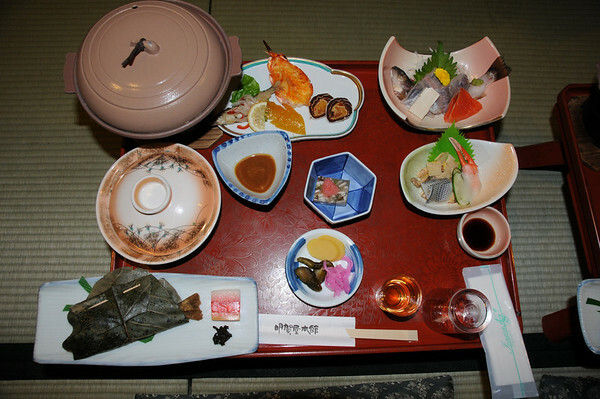 Fairly simple kaiseki. The best were the beef cooked on a hotplate and some sashimi (aiyu I think). The highlight was the riverside onsen. There are men's and women's indoor hot tubs. 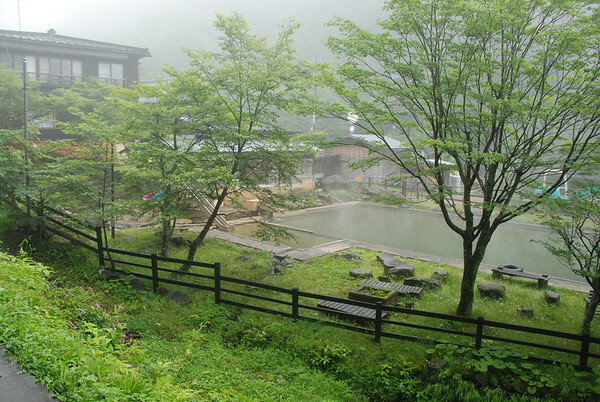 When we were there the outdoor onsen was mixed in the evening and women only in the morning (6AM - 8AM). There are different pools of different temperature. You are right by the river and can dip your feet in it if you like. Midweek, peak season (they told us its more expensive when we went in November) it cost 9000 yen each for 4 to a room (I think 2 to a room is 11k each).